29 So Israel set men in ambush around Gibeah. 30 And the people of Israel went up against the people of Benjamin on the third day and set themselves in array against Gibeah, as at other times. 31 And the people of Benjamin went out against the people and were drawn away from the city. And as at other times they began to strike and kill some of the people in the highways, one of which goes up to Bethel and the other to Gibeah, and in the open country, about thirty men of Israel. 32 And the people of Benjamin said, “They are routed before us, as at the first.” But the people of Israel said, “Let us flee and draw them away from the city to the highways.” 33 And all the men of Israel rose up out of their place and set themselves in array at Baal-tamar, and the men of Israel who were in ambush rushed out of their place from Maareh-geba. 34 And there came against Gibeah 10,000 chosen men out of all Israel, and the battle was hard, but the Benjaminites did not know that disaster was close upon them. 35 And the Lord defeated Benjamin before Israel, and the people of Israel destroyed 25,100 men of Benjamin that day. All these were men who drew the sword. 36 So the people of Benjamin saw that they were defeated. The men of Israel gave ground to Benjamin, because they trusted the men in ambush whom they had set against Gibeah. 37 Then the men in ambush hurried and rushed against Gibeah; the men in ambush moved out and struck all the city with the edge of the sword. 38 Now the appointed signal between the men of Israel and the men in the main ambush was that when they made a great cloud of smoke rise up out of the city 39 the men of Israel should turn in battle. Now Benjamin had begun to strike and kill about thirty men of Israel. They said, “Surely they are defeated before us, as in the first battle.” 40 But when the signal began to rise out of the city in a column of smoke, the Benjaminites looked behind them, and behold, the whole of the city went up in smoke to heaven. 41 Then the men of Israel turned, and the men of Benjamin were dismayed, for they saw that disaster was close upon them. 42 Therefore they turned their backs before the men of Israel in the direction of the wilderness, but the battle overtook them. And those who came out of the cities were destroying them in their midst. 43 Surrounding the Benjaminites, they pursued them and trod them down from Nohah as far as opposite Gibeah on the east. 44 Eighteen thousand men of Benjamin fell, all of them men of valor. 45 And they turned and fled toward the wilderness to the rock of Rimmon. Five thousand men of them were cut down in the highways. And they were pursued hard to Gidom, and 2,000 men of them were struck down. 46 So all who fell that day of Benjamin were 25,000 men who drew the sword, all of them men of valor. 47 But 600 men turned and fled toward the wilderness to the rock of Rimmon and remained at the rock of Rimmon four months. 48 And the men of Israel turned back against the people of Benjamin and struck them with the edge of the sword, the city, men and beasts and all that they found. And all the towns that they found they set on fire. 1Then all the children of Israel went out, and the congregation was gathered together as one man, from Dan even to Beersheba, with the land of Gilead, unto the LORD in Mizpeh.2And the chief of all the people, even of all the tribes of Israel, presented themselves in the assembly of the people of God, four hundred thousand footmen that drew sword.3(Now the children of Benjamin heard that the children of Israel were gone up to Mizpeh.) Then said the children of Israel, Tell us, how was this wickedness?4And the Levite, the husband of the woman that was slain, answered and said, I came into Gibeah that belongeth to Benjamin, I and my concubine, to lodge.5And the men of Gibeah rose against me, and beset the house round about upon me by night, and thought to have slain me: and my concubine have they forced, that she is dead.6And I took my concubine, and cut her in pieces, and sent her throughout all the country of the inheritance of Israel: for they have committed lewdness and folly in Israel.7Behold, ye are all children of Israel; give here your advice and counsel.8And all the people arose as one man, saying, We will not any of us go to his tent, neither will we any of us turn into his house.9But now this shall be the thing which we will do to Gibeah; we will go up by lot against it;10And we will take ten men of an hundred throughout all the tribes of Israel, and an hundred of a thousand, and a thousand out of ten thousand, to fetch victual for the people, that they may do, when they come to Gibeah of Benjamin, according to all the folly that they have wrought in Israel.11So all the men of Israel were gathered against the city, knit together as one man.12And the tribes of Israel sent men through all the tribe of Benjamin, saying, What wickedness is this that is done among you?13Now therefore deliver us the men, the children of Belial, which are in Gibeah, that we may put them to death, and put away evil from Israel. But the children of Benjamin would not hearken to the voice of their brethren the children of Israel:14But the children of Benjamin gathered themselves together out of the cities unto Gibeah, to go out to battle against the children of Israel.15And the children of Benjamin were numbered at that time out of the cities twenty and six thousand men that drew sword, beside the inhabitants of Gibeah, which were numbered seven hundred chosen men.16Among all this people there were seven hundred chosen men lefthanded; every one could sling stones at an hair breadth, and not miss.17And the men of Israel, beside Benjamin, were numbered four hundred thousand men that drew sword: all these were men of war.18And the children of Israel arose, and went up to the house of God, and asked counsel of God, and said, Which of us shall go up first to the battle against the children of Benjamin? And the LORD said, Judah shall go up first.19And the children of Israel rose up in the morning, and encamped against Gibeah.20And the men of Israel went out to battle against Benjamin; and the men of Israel put themselves in array to fight against them at Gibeah.21And the children of Benjamin came forth out of Gibeah, and destroyed down to the ground of the Israelites that day twenty and two thousand men.22And the people the men of Israel encouraged themselves, and set their battle again in array in the place where they put themselves in array the first day.23(And the children of Israel went up and wept before the LORD until even, and asked counsel of the LORD, saying, Shall I go up again to battle against the children of Benjamin my brother? And the LORD said, Go up against him. )24And the children of Israel came near against the children of Benjamin the second day.25And Benjamin went forth against them out of Gibeah the second day, and destroyed down to the ground of the children of Israel again eighteen thousand men; all these drew the sword.26Then all the children of Israel, and all the people, went up, and came unto the house of God, and wept, and sat there before the LORD, and fasted that day until even, and offered burnt offerings and peace offerings before the LORD.27And the children of Israel inquired of the LORD, (for the ark of the covenant of God was there in those days,28And Phinehas, the son of Eleazar, the son of Aaron, stood before it in those days,) saying, Shall I yet again go out to battle against the children of Benjamin my brother, or shall I cease? And the LORD said, Go up; for to morrow I will deliver them into thine hand.29And Israel set liers in wait round about Gibeah.30And the children of Israel went up against the children of Benjamin on the third day, and put themselves in array against Gibeah, as at other times.31And the children of Benjamin went out against the people, and were drawn away from the city; and they began to smite of the people, and kill, as at other times, in the highways, of which one goeth up to the house of God, and the other to Gibeah in the field, about thirty men of Israel.32And the children of Benjamin said, They are smitten down before us, as at the first. But the children of Israel said, Let us flee, and draw them from the city unto the highways.33And all the men of Israel rose up out of their place, and put themselves in array at Baaltamar: and the liers in wait of Israel came forth out of their places, even out of the meadows of Gibeah.34And there came against Gibeah ten thousand chosen men out of all Israel, and the battle was sore: but they knew not that evil was near them.35And the LORD smote Benjamin before Israel: and the children of Israel destroyed of the Benjamites that day twenty and five thousand and an hundred men: all these drew the sword.36So the children of Benjamin saw that they were smitten: for the men of Israel gave place to the Benjamites, because they trusted unto the liers in wait which they had set beside Gibeah.37And the liers in wait hasted, and rushed upon Gibeah; and the liers in wait drew themselves along, and smote all the city with the edge of the sword.38Now there was an appointed sign between the men of Israel and the liers in wait, that they should make a great flame with smoke rise up out of the city.39And when the men of Israel retired in the battle, Benjamin began to smite and kill of the men of Israel about thirty persons: for they said, Surely they are smitten down before us, as in the first battle.40But when the flame began to arise up out of the city with a pillar of smoke, the Benjamites looked behind them, and, behold, the flame of the city ascended up to heaven.41And when the men of Israel turned again, the men of Benjamin were amazed: for they saw that evil was come upon them.42Therefore they turned their backs before the men of Israel unto the way of the wilderness; but the battle overtook them; and them which came out of the cities they destroyed in the midst of them.43Thus they enclosed the Benjamites round about, and chased them, and trode them down with ease over against Gibeah toward the sunrising.44And there fell of Benjamin eighteen thousand men; all these were men of valour.45And they turned and fled toward the wilderness unto the rock of Rimmon: and they gleaned of them in the highways five thousand men; and pursued hard after them unto Gidom, and slew two thousand men of them.46So that all which fell that day of Benjamin were twenty and five thousand men that drew the sword; all these were men of valour.47But six hundred men turned and fled to the wilderness unto the rock Rimmon, and abode in the rock Rimmon four months.48And the men of Israel turned again upon the children of Benjamin, and smote them with the edge of the sword, as well the men of every city, as the beast, and all that came to hand: also they set on fire all the cities that they came to. 25And, behold, a certain lawyer stood up, and tempted him, saying, Master, what shall I do to inherit eternal life?26He said unto him, What is written in the law? how readest thou?27And he answering said, Thou shalt love the Lord thy God with all thy heart, and with all thy soul, and with all thy strength, and with all thy mind; and thy neighbour as thyself.28And he said unto him, Thou hast answered right: this do, and thou shalt live.29But he, willing to justify himself, said unto Jesus, And who is my neighbour?30And Jesus answering said, A certain man went down from Jerusalem to Jericho, and fell among thieves, which stripped him of his raiment, and wounded him, and departed, leaving him half dead.31And by chance there came down a certain priest that way: and when he saw him, he passed by on the other side.32And likewise a Levite, when he was at the place, came and looked on him, and passed by on the other side.33But a certain Samaritan, as he journeyed, came where he was: and when he saw him, he had compassion on him,34And went to him, and bound up his wounds, pouring in oil and wine, and set him on his own beast, and brought him to an inn, and took care of him.35And on the morrow when he departed, he took out two pence, and gave them to the host, and said unto him, Take care of him; and whatsoever thou spendest more, when I come again, I will repay thee.36Which now of these three, thinkest thou, was neighbour unto him that fell among the thieves?37And he said, He that showed mercy on him. Then said Jesus unto him, Go, and do thou likewise. 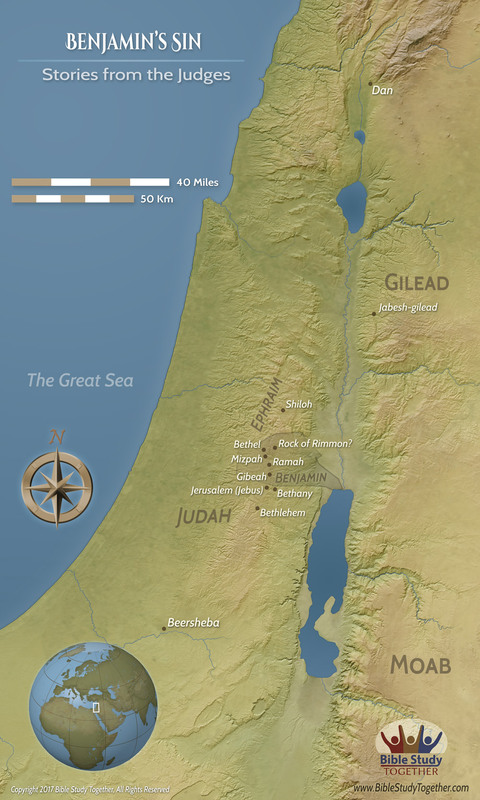 Why did the people of Israel attack the Benjaminites? What does Jesus say we must do to inherit eternal life? Will the priest and levite in the parable inherit eternal life according to Jesus? What does it mean for you to love your neighbors as yourself?